Since her early twenties, Air Force Captain Desiree Wagner has always dreamt of having her own car wash in Fairfax VA and be her own boss. Fairfax County, VA, September 13th , 2016 – Since her early twenties, Air Force Captain Desiree Wagner has always dreamt of having her own car wash in Fairfax VA and be her own boss. This Medical Service Corps (Health Service Administrator) Officer assigned to the Defense Health Headquarters in Falls Church, Virginia has been serving the country for over 21 years. But as much as she loves her fellowmen, she realized that her two kids, aged 14 and 2, must now be her priority. She knew that juggling her time between earning a living and raising two energetic children can only be possible by having her own business. This was when she started entertaining the thought of really starting a business. To learn more about entrepreneurship, she attended the Officers Women Leadership Symposium (OWLS) earlier this year where she met her coach Stephanie Lewis of The Entrepreneur’s Source. Through the latter, she learned that being her own boss is possible. Armed with newfound knowledge and the desire to invest on something that could provide her with a means to earn a living, she started her search for the right business opportunity. It has to be profitable, flexible, and environmentally friendly.Among the four franchisees that she looked into, it was DetailXPerts that grabbed her attention. “First was the convenience of working from home. Next was the product. I also was impressed with the amount of support they provide. And finally, the growth potential,” Desiree says. Working at home will allow her to spend more quality time with her children. It will also give her more flexibility in terms of profit and growth potential. DetailXPerts’ water saving method and use of organic materials also influenced her decision. The company only uses a pint of water for cleaning an entire car, and just five gallons for an average-sized truck. Since it does not use auto detailing products that contain toxic substances, no runoff occurs. And DetailXPerts’ growth in the county is very possible considering the number of vehicle owners who want to keep their prized possessions clean and shiny all the time coupled with Fairfax’ strict stormwater management ordinance that prohibits untreated and unpermitted vehicle wash water from entering the storm drainage system and DetailXPerts uses a very minimal amount of water for cleaning vehicles: a pint for an average-sized car and five gallons for an entire truck. This means zero wastewater which aligns with the county’s mandate. 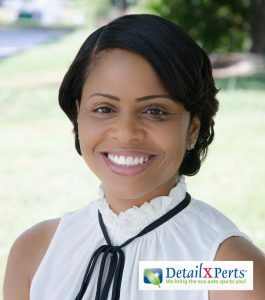 Aside from car washing, DetailXPerts of Fairfax County South also offers mobile truck wash, interior detailing, truck and RV wash, mobile car detailing, professional car detailing, trailer washout, auto detailing, truck washout, fleet cleaning, fleet wash, and hand carwash, to vehicle owners in the area. Other lines of service include boats, motorcycles, buses, RVs, and more. Businesses are welcome to inquire for special rates and long-term relations. You can easily reach them at 703-881-9170 to schedule a free demo!